The very enticing 2016 Calliope Viognier opens on a complex nose of ripe white peach, Sungold apricot and orange blossom, enlivened by ruby red grapefruit and tangerine undertones. There is richness to the palate with flavours of peach, red plum and candied apricot combined with hints of caramel and vanilla and, balanced out by refreshing lemon-lime and herbal notes. A great sipping wine, it will also win over your taste buds when paired with cilantro-spiked fish tacos, West Coast ceviche, Prosciutto wrapped melon, or spiced up pad thai. 2016 was another amazing growing season. Spring arrived early: sunny and warm with just enough showers to boost vine canopy growth. July and August added ideal summer heat, ripening the grapes slowly. 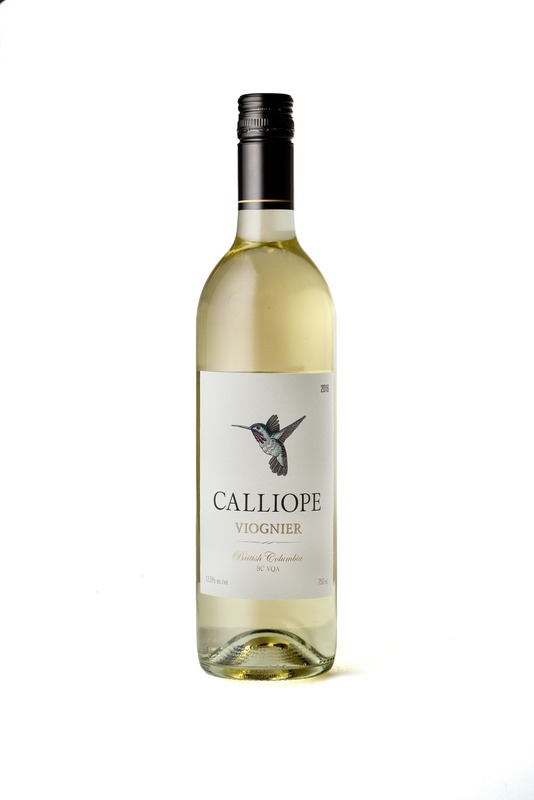 Lively and aromatic whites were picked during a dry September month while red grapes benefited from warm days and cool nights fully developing their flavours while retaining their acidity. The grapes for the 2016 vintage originate from Osoyoos and Oliver. They were harvested manually between September 22nd and October 1st 2016; they were hand sorted and dropped whole clustered into a pneumatic press for a gentle extraction. The juice was then drained by gravity flow into oak barrels (35%) and stainless steel tanks (65%) for the alcoholic fermentation. After 3 weeks under controlled temperatures ranging from 13 to 16 Celsius, the wine was allowed to mellow for 5 months. It was then finned, filtered and stabilized before bottling.